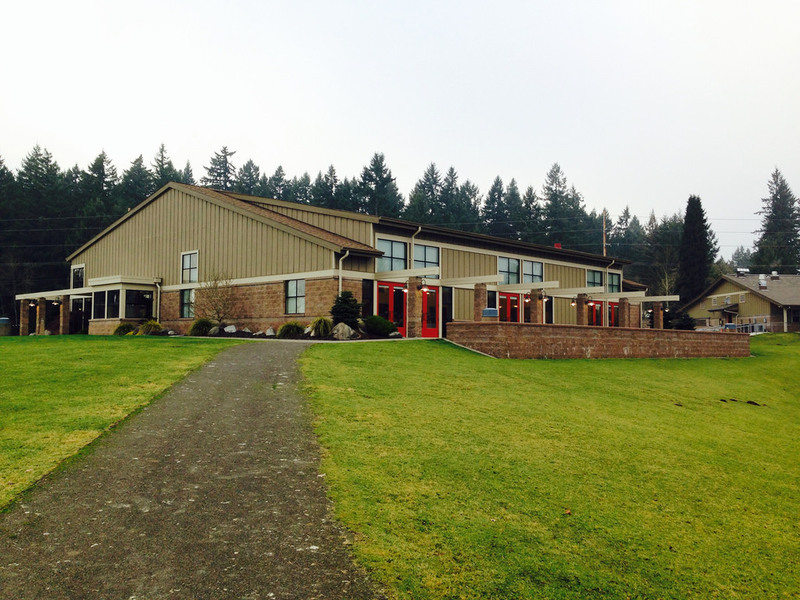 The Lacey Community Center at 6729 Pacific Avenue SE, Lacey has a charming little pond adjacent to it. If it had been warmer, I would have strolled around it. The center itself is relatively new and very well tended to and the staff was very accommodating. This entry was posted in Community Space, Lacey, Parks, WA State - Thurston County and tagged Lacey, Lacey Community Center, meetings, pond on January 31, 2014 by admin. 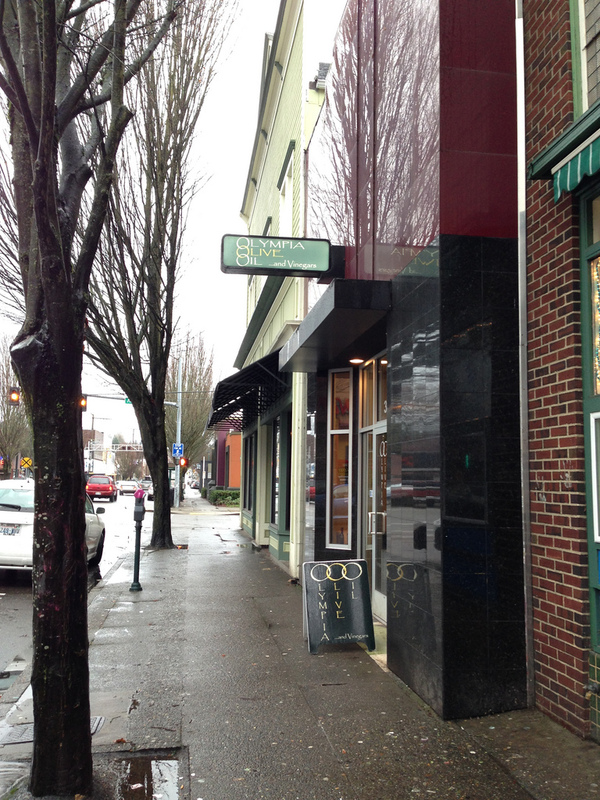 I had a quick lunch at European Bistro at 2515 North Proctor in Tacoma and it was delicious. I was in a rush and picked what I assumed was the quickest thing available, the lentil soup. It was a full bowl and coupled with the warm bread made an exceptional meal, especially considering it was less than $4! I’m eager to go back when I have a little more time and try some other items on their menu. It all looks good. There website is here. This entry was posted in Restaurants, Sit Down Establishments and tagged District, European Bistro, Proctor, restaurant, Tacoma on January 24, 2014 by admin. The Steilacoom-Anderson Island ferry has its primary ferry landing in Steilacoom. Ferries depart to Ketron Island and Anderson Island and previously McNeil Island. The ferry route is owned and operated by Pierce County. The first ferry went into service on April 1, 1922. This entry was posted in Steilacoom, Travel, WA State - Pierce County and tagged Anderson, ferry, Ketron, Landing, McNeil, Steilacoom, WA State - Pierce County on January 23, 2014 by admin. There is a small, private park named City Haven Peace Park located next to the Quaker Meetinghouse/Hillside Community Church at 2508 39th Street South. This space has an abundance of birds, squirrels and an occasional raccoon. There are also several inuksuk, which are rock formations roughly shaped like humans. 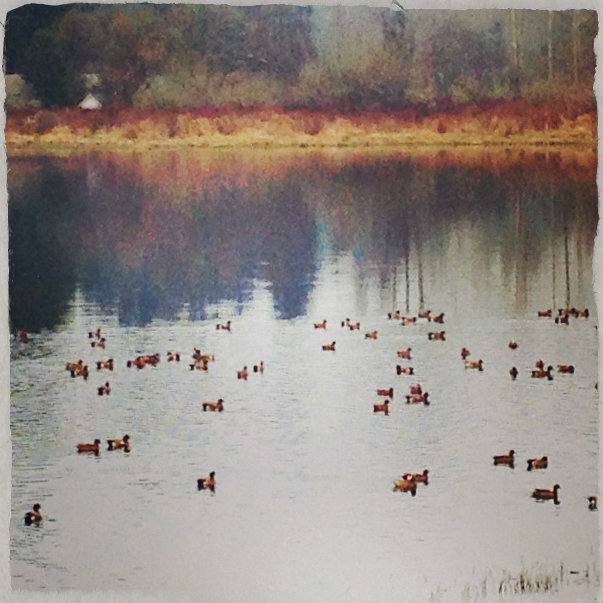 This entry was posted in Art -- there is art here!, Parks, Tacoma, WA State - Pierce County and tagged animals, birds, City Haven Peace Park, inuksuk, Park, peaceful, Tacoma on January 22, 2014 by admin. 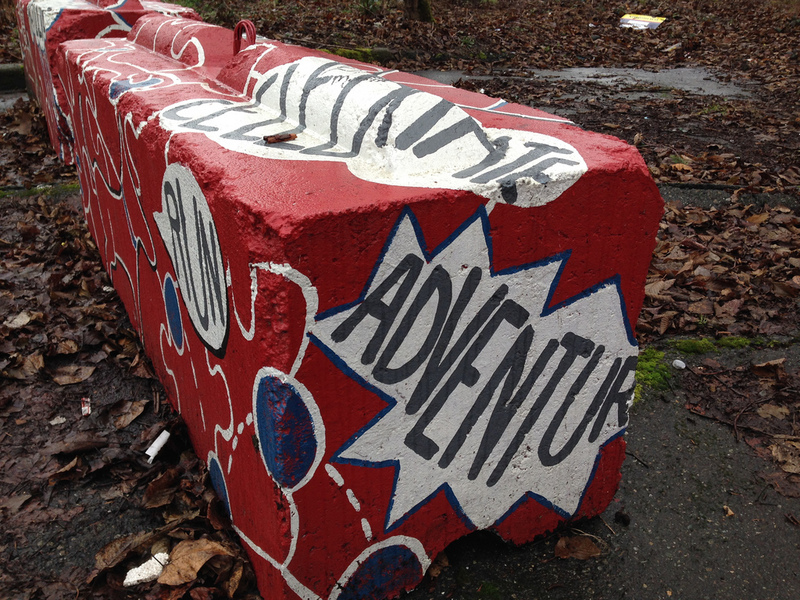 One has to look hard for the mural on the barrier blocks at 5699 Pipeline Road East, Tacoma. But they are worth the Eastside search with their bold, red color and jaunty graphics. My favorite barrier (if one can have a favorite barrier) is the one with the word ‘Adventure’ on it! The artists are Natalie Oswald, K. Candejas, Y. Simone and J. Warren. 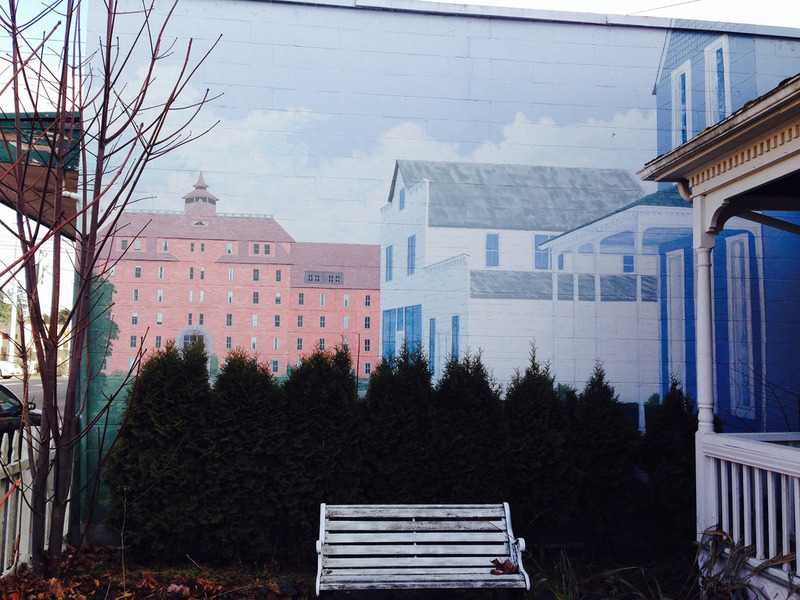 The Tacoma Murals Project mural was created in 2012. The top photo shows the barriers as they sit and the bottom photo shows them Photoshopped side by side. This entry was posted in Art -- there is art here!, Tacoma, WA State - Pierce County and tagged barrier, blocks, eastside, J. Warren, K. Candejas, mural, Natalie Oswald, Red, Tacoma, Tacoma Murals Project, Y. Simone on January 12, 2014 by admin. I like stores that do one thing well and that is the case with Olympia Olive Oil Company at 321 4th Avenue East in Olympia. 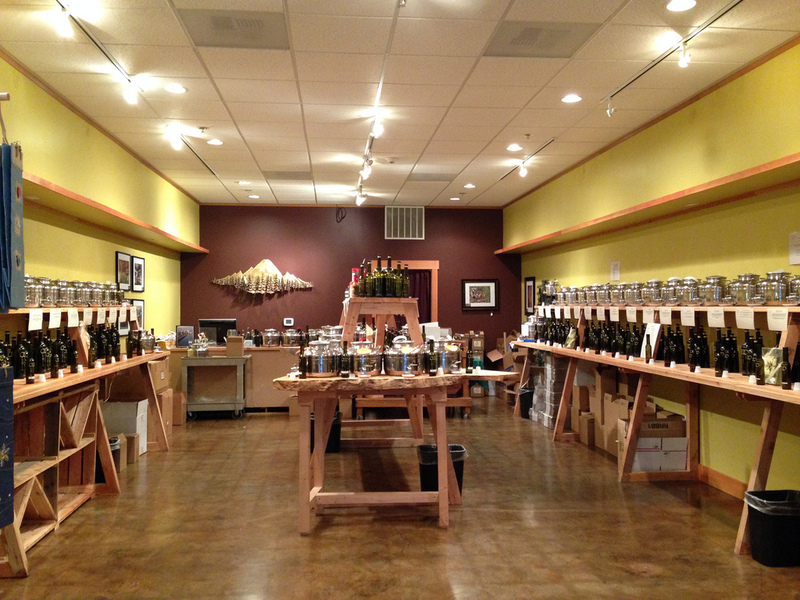 Crafted extra virgin olive oils (on the left) and flavored balsamic vinegars (on the right) and a small collection of salts and seasonings are what the store features. The vinegars and the oils maybe tasted in little disposable cups, which was a wonderful opportunity. Once you make your selection, the owner pours the oil/vinegar into the bottle, puts on a label and corks it. I left with two olive oils (blood orange and garlic) and a lemon balsamic vinegar. They have a second location in the South Hill Mall in Puyallup. It’s possible to order online at their website. This entry was posted in Olympia, Stores and other places that sell you things, Unique Shopping (stores with some personality), WA State - Thurston County and tagged downtown, flavored, olive oil, Olympia, Olympia Olive Oil, sample, spices, Vinegar on January 12, 2014 by admin. 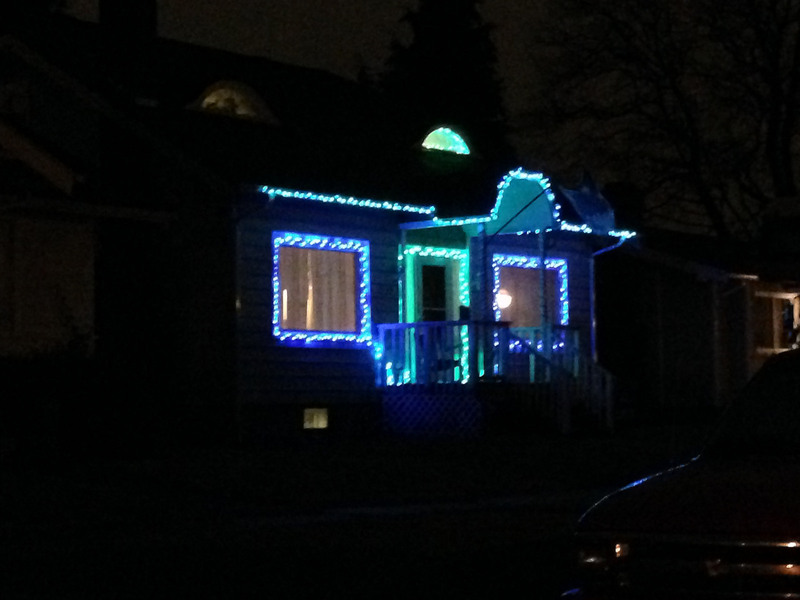 It took me a beat to realize why some folks have left their holiday lights up when I realized they are in Seahawks blue and green. Oh, I get it! The Seahawks play in the NFL Second Round Playoffs against the New Orleans Saints on Saturday. Go hawks! 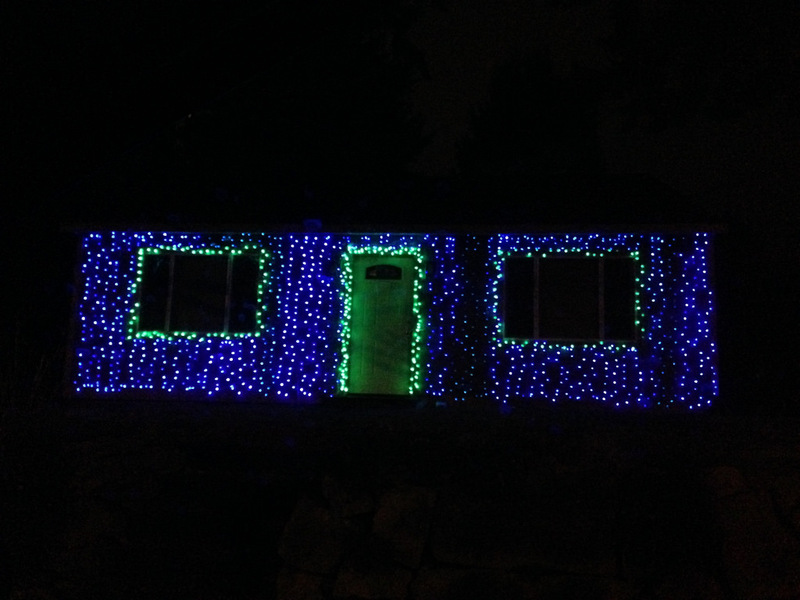 This entry was posted in Sports, Tacoma, WA State - Pierce County and tagged football, house, lights, Seahawls, sports on January 8, 2014 by admin.